I don’t know how it is where *you* live but here in Atlanta, it’s oppressively hot. It’s too hot to move. It’s almost too hot to live. Seriously. Whoever is responsible for moving the Equator north unannounced…I need to see you in my office immediately. Given the current climate, you can imagine that there is almost zero cooking going on that requires firing up the stove. That’s why I was so pleased to see the one off blog event over at My Life As A Reluctant Housewife’s blog (currently in the running for funniest blog title, IMO). It’s simple – submit a great summer salad recipe. I stumbled upon this recipe on Food and Wine’s website. It struck me as a more rustic, loosey-goosey version of prosciutto and melon. I veered from the recipe a bit. I left out the chives and skipped the bread step all together. Instead, I added the goat cheese to the salad itself. This combination of flavors was wonderful: the sweet cantaloupe, the tang of the goat cheese, and the saltiness of the soppressata worked for me. While I tweaked my version of the salad, I can see serving it with the goat cheese slathered bread like a cantaloupe bruschetta. 1. 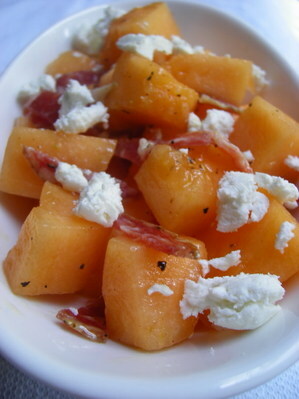 Put the melon cubes in large bowl and season with salt and black pepper. Add the oil and toss gently and then add the vinegar. Garnish with the soppressata and chives. Spread the cheese evenly on each piece of bread and serve with the salad. I stumbled upon this site as I was in the process of doing some online research. This dish made my mouth water. I’m certainly going to try this dish sometime soon. oh wait. I have to add. Thanks so much for joining in Salad days! And the update will be up in a few days. What a stunning salad! Too bad my husband is not a fruit eater. I guess I’ll just have to have a party so I can make it.